Collecting rain water is one method of augmenting water storage in places where rainfall is sufficient, thereby increasing a family's available clean water. There are many areas where rainfall is abundant but surface water is unsafe to drink. In the Amazon basin and in other equatorial rain forests, collecting rain water may be a very productive method of obtaining clean water. This web page describes each type of catchment system for collecting rain water and discusses its advantages and disadvantages. Before deciding to use a rainfall catchment to collect rain water, be sure to determine that the quantity of water it will produce is sufficient to meet local or individual needs and that enough storage can be provided. The design of cisterns for the storage of rainwater is described in Designing a Household Cistern. (d) the capability of the users to disinfect it and clean it periodically. Roof catchments differ from other sources of surface water because a great responsibility for operation and maintenance rests with the individual user rather than the community. Water quality will depend on the user cleaning the pipes and gutters and disinfecting the stored water. If rainfall catchments are installed, the users must be thoroughly trained in techniques of operation and maintenance. Roof catchments can only be used for collecting rain water where roofing materials are suitable. 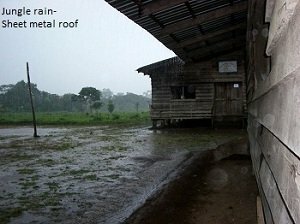 Do not plan to develop rain catchments on thatched, painted, or lead roofs. The water running from them is likely to be very contaminated. Water is likely to seep into thatched roofs and be lost. Determine if tiles, slate, or corrugated plastics, tin, or aluminum sheets are available and can be acquired by the village. Generally sheet metal is preferable because of its light weight and strength. Tiles are also good because they can be made locally. However, they are much heavier than sheet metal and need a strong roof structure to support them without sagging. 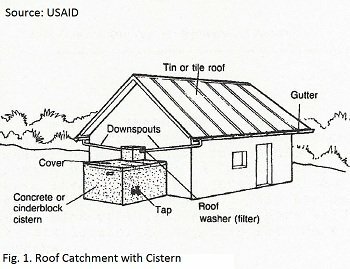 To use a roof catchment for collecting rain water, there must be sufficient rainfall. The amount and monthly distribution of annual rainfall for a region should be available from local inhabitants, a local agricultural or other governmental agency, or from an airport. If you know the amount of annual rainfall, it will be easy to determine the amount of water available from the catchment for consumption after collecting rainwater. Use monthly rainfall data if available. This data will help planning for storage capacity during the dry months. To find the amount of water available yearly or monthly, multiply the area of the catchment by the annual average rainfall. Then, multiply this amount by 80 percent. Only 80 percent of the total volume of rainfall generally is available for use because of evaporation and other losses. 800mm x 48 sq. meters x 0.80 = 30.72 cubic meters per year. There are 1000 liters in 1 cubic meter, so 30.72 cubic meters x 1000 = 30,720 liters per year. Compare the amount of water available to the amount of water needed to meet the user’s needs. A system for collecting rain water must provide a minimum of 15 liters of water per person per day. In the example above, each member of a family of five would be able to use 17 liters or water per day. If the family had six members, each person would have 14 liters of water. See how one South African company uses rainwater harvesting systems to supplement water supplies and conserve precious water in a region where annual rainfall is relatively scarce. A cistern must be placed either above or below ground to collect water from the catchment. A cistern can be as simple as a 200-liter barrel, a tank constructed from reinforced concrete, as in Figure 1, or any other suitable collection container. The basic design features of a household cistern are discussed in "Designing a Household Cistern”. If rainfall is evenly distributed throughout the year, the general rule is that a permanent cistern must be large enough to store a one month supply of water. In the example used above, 2560 liters per month are available for use. The cistern for this particular system should have a capacity of between 2.5 and 3.0 cubic meters. A cistern with a capacity of 2.5 cubic meters can store 2500 liters and a 3 cubic meters capacity cistern, 3000 liters. If resources are not available to build a cistern of this capacity, the largest cistern possible should be built. If rainfall is heavy during some months but there is a dry season with little or no rain, the size of the cistern can be increased to store water during the wet season for use in the dry. The problem is that if a dry season is three months long and a three-month supply must be stored, the cistern would have to be very large and would be very expensive to build. This would be impossible for most individual families. There are several alternatives, however. One alternative is to use collected rain water for drinking and cooking only and find another source for washing and bathing. In this way, water use from the cistern can be reduced. If rainwater is used only for drinking, then smaller, less expensive cisterns can be built. Also, other less permanent designs could be used. Figures 2 and 3 show cisterns that may be suitable for some regions. 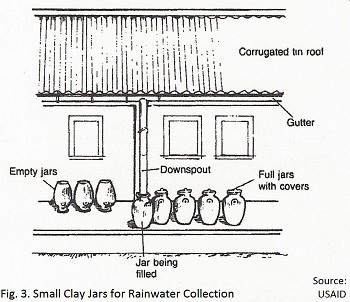 Large clay, concrete, or ferrocement jars that cannot be moved can be made to collect rainwater from the roof. These jars are frequently made locally and cost very little. The price is much less than for a reinforced concrete cistern. 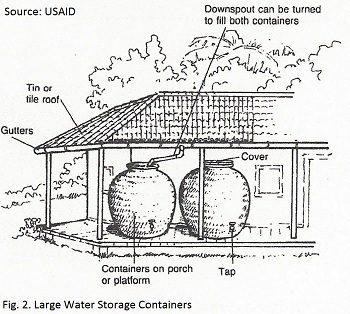 To collect enough water, several jars can be used, placed near the roof. The downspout will have to be moved to fill the empty jar. Two or three jars can be made or bought for the cost of one small concrete cistern. A similar technique is to use smaller, portable clay jars that can easily be moved under the downspout during a rainstorm. A family collecting rain water could have several 25-liter jars which can be filled during rainfalls. This system will work efficiently, but there will be little storage capacity for the dry months. Ground catchments are areas prepared on the ground surface in a special way for collecting rain water. The amount of water that can be collected will depend on the amount of rainfall, the area or the catchment, and the runoff characteristics of the surface. If rainwater is the primary water source, a roof catchment on each roof in a community would be expensive and impractical. Ground catchments, if prepared properly, will provide more water than roof catchments since more surface area can be used for collection. For this reason, ground catchments are more economical for collecting rain water in a small community. 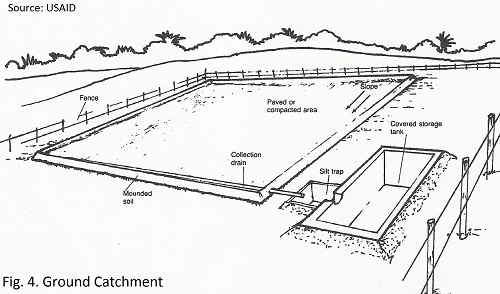 See Figure 4 for an example of a ground catchment. The ground catchment surface is very important in collecting rain water efficiently. Catchment surfaces must be impervious to avoid water losses from infiltration and seepage. On pervious surfaces, much of the rain will be lost for community use. Part of it will wet the ground and part will be stored in small ground depressions. Other water losses will occur through infiltration into the ground, evaporation into the air, and transpiration through plants. One type of ground catchment has a surface that has been simply smoothed and cleaned of vegetation. Compacted clay soils make good catchment surfaces for collecting rain water because the clay is relatively impervious and will need little or no treatment to seal soil pores. In areas where there is no impervious soil, various materials can be used to cover pervious ground surfaces to prevent water losses. Cement, asphalt, or even polyethylene sheeting can be laid over the surface of the ground to prevent seepage and infiltration. The major problem is that the materials used to cover the ground surface are very expensive and may not be available in many rural areas. The need for storage in a cistern and for treatment adds to the total cost. Chemical treatment of a catchment surface can help in collecting rain water by making the soil impervious. Sodium salts, which cause clay in soil to break down into small particles and seal soil pores help make soil containing clay impervious so that run-off is increased. Tar or asphalt can also be used on catchment surfaces. These materials can be sprayed on the surface and effectively seal soil pores. Chemical treatment is usually not very expensive and the surface generally lasts for four or five years. However, in many rural areas, the chemicals for ground treatment may not be available or may be expensive. In this case, a simple catchment of compacted earth would be the best alternative. The amount of water available or use from ground catchments depends on the amount of annual rainfall and the area of the catchment. Because catchment areas are large, a lot of water can be collected from a small amount of rainfall. If the area of the catchment is large enough, the surface impervious, and the slope steep enough to ensure rapid run-off and minimum losses to evaporation and transpiration, collecting rain water can meet the needs of a small community can be with as little as 80mm of annual rainfall. Evaporation, infiltration, seepage, and transpiration will all affect the amount of water reaching the catchment area that is available for use. If the catchment surface is pervious or poorly constructed, little or no water will be collected. In a well-designed and maintained catchment, up to 90 percent of the water reaching it can be collected. The ground catchment can be at least as efficient as a roof catchment in collecting rain water. However, if the ground is poorly prepared or inadequately covered, losses through infiltration will be high. Careful catchment preparation is necessary. Consider a catchment area one-quarter hectare in area (50m x 50m) in a region with an annual rainfall of only l00mm. Also assume that the catchment efficiency is only 80 percent, the same as the roof catchment. l00mm x 2500 sq. meters x .80 = 200,000 liters per year. This would be 16,660 liters per month or 555 liters per day. If consumption is 15 liters per person per day, this system for collecting rain water would supply enough water for 37 people. Water from the ground catchment must flow into a storage tank to be available to users. Storage tanks for ground catchments are generally located in the ground and the water must be pumped from the cistern to the users using either a hand or power pump. The storage tank must be large enough to take advantage of all available rainfall during a month and store it during dry periods. The larger the storage tank, the more costly it will be to build. The best storage tank will meet the needs of the users during both wet and dry seasons. For example, a storage tank 1.5m x 1.5m x 1.5m will hold 3,375 liters. In the example above, the amount of water available is 16,660 liters per month. A storage tank with a capacity of 17 cubic meters would have to be constructed to hold this amount of water. A storage tank of this size would be very costly to build and would be impractical in many areas. Possibly, a cistern with half that capacity, 9,000 liters, would be more reasonable. In each case the size of the cistern depends on the amount of water which must be stored. The cistern should be only as large as necessary and as resources permit. The type of ground catchment used depends on the availability of materials, on soil type, and on the resources available in the community. Because ground catchment systems are generally expensive they are rarely used for individual families. They can be effective for several families or a small community. Although costly, ground catchments may be the best alternative for water supply in areas of little rainfall where groundwater and other surface water sources are inaccessible. The two types of rainfall catchments can be used for collecting rain water in areas where it is uneconomical or unsafe to use other sources of water for drinking. * they are easy to maintain. Ground catchments are more expensive than roof catchments because of material and labor costs. They should be considered in areas where rainfall is very scarce and other water sources are not available. Ground catchments are best suited for collecting rain water for several families or for small community suppliers rather than individual families. * if properly designed, they are very efficient collectors. Return to "Surface Water" from "Collecting Rain Water"